Please watch our CBC news video that explains our special Cans for Kids project. Accolades abound to teacher and Environmental Committee member, Cathy Delaney, for her leadership with this project. When she first saw the late Mr. Battcock on the news, she brought the story to our committee and spearheaded our consequent involvement. Mr. Battcock's legacy will live on at Beachy Cove Elementary. He helped many children around the world and inspired many more. Our next Cans for Kids campaign will take place in MAY 2019. Click here for all the details. ​Please familiarize yourself with what can and cannot be recycled by clicking HERE. Our fourth year proved to be another successful one! We raised over $1800! We continue to watch the number of children we help grow by helping an additional SIX children this year! That gives us ALL a good reason to smile! Our Environmental Agents are excited and very proud to announce that our AWESOME school community has helped us raise $2000 during our Cans for Kids campaign in May! This money will be sent to Smile Train to provide free cleft lip and palate surgeries to EIGHT children in developing countries. Since beginning this fundraiser in 2014, our school community has actually given 22 children a reason to SMILE!!! Thank you to our students and families who donated their recyclables and made monetary donations. And hats off to our environmental agents who promoted this amazing initiative!!! This is just more proof that Beachy Cove Elementary is the greatest school on earth! 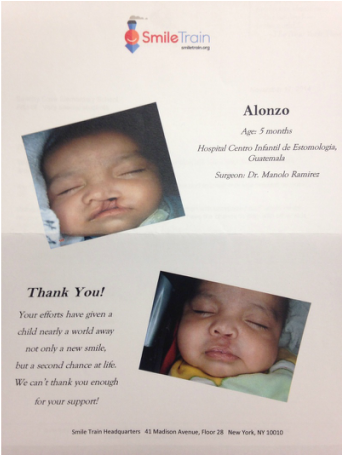 Our goal this year was to help one additional child get their surgery, making it a total of three children. Through the generous donations of our school community and the enthusiastic participation in our recycling program during the month of March, we ensured TWELVE children's surgeries! Our Environmental Agents are excited to announce that we raised over $500 in our “Cans for Kids” recycling fundraiser last June! This amount was be sent to Smile Train, a non-profit organization committed to helping children in developing countries receive cleft lip and palate surgeries. 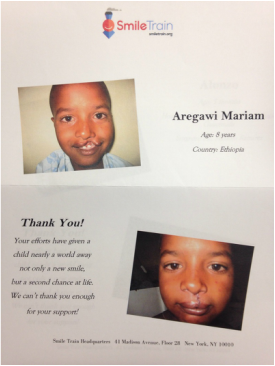 Each surgery costs $250 so we helped TWO children smile. We would like to thank our school community for their help and support in this worthwhile initiative which was inspired by Ed Battcock from Labrador. Please watch our video above. This endeavour was so successful, we have decided to hold another Cans For Kids recycling fundraiser in March 2015! Let’s aim to raise $750 so we can help three children next time! Stay tuned for more information and keep those recyclables coming!! !